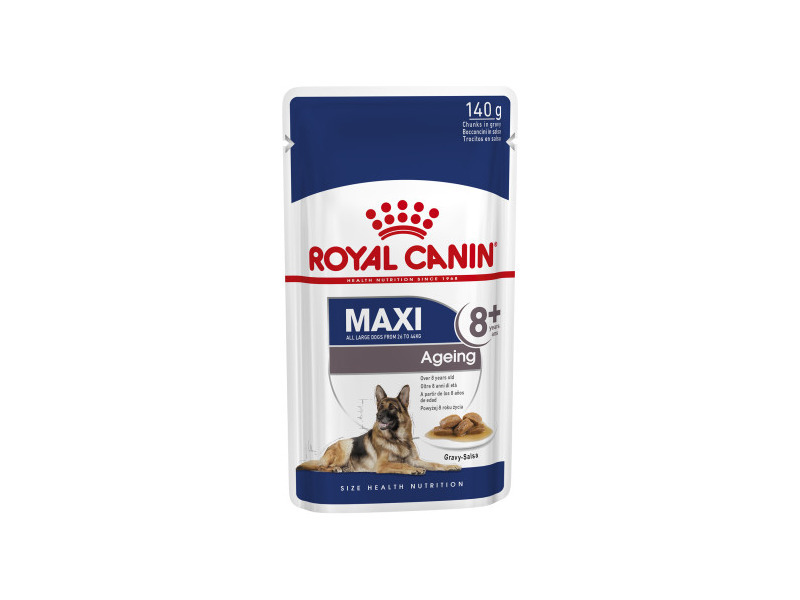 Royal Canin Maxi Ageing 8+ is a complete food for large breed adult dogs, weighing 26-44kg at maturity. The diet contains a specially formulated recipe of ingredients to cater to the specific needs of maxi breeds, including L-carnitin for the maintenance of appropriate body mass, sulphur amino acids and omega fatty acids for promoting a glossy coat and reinforcing the skin and its natural defense barrier. The recipe is palatable with a delicious blend of natural flavours and highly digestible to suit even the fussiest canine appetites. Helping to support your dog throughout the ageing process, with high levels of blended glucosamine and chondroitin for healthy joints and greater mobility and complex antioxidants to neutralise free radicals. A selection of nutrients to support healthy ageing in senior medium breed dogs.Contains EPA-DHA and an exclusive complex of antioxidants to help neutralise free radicals. Complete feed for dogs - For senior large breed dogs (from 26 to 44 kg) - Over 8 years old. Healthy Ageing Support - A selection of nutrients to support healthy ageing in senior medium breed dogs.Contains EPA-DHA and an exclusive complex of antioxidants to help neutralise free radicals. Bone & Joint Support - Helps support large breed dogs’ bones and joints placed under stress. Healthy Transit - Helps facilitate intestinal transit thanks to an adapted fibre content and contributes to good stool quality thanks to proteins selected for their high digestibility. Skin & Coat Condition - Contains specific nutrients for a shiny coat and a healthy skin. Dehydrated poultry protein, rice, animal fats, wheat, wheat flour, maize, maize gluten, hydrolysed animal proteins, vegetable protein isolate*, beet pulp, vegetable fibres, minerals, fish oil, yeasts, soya oil, tomato (source of lycopene), psyllium husks and seeds, fructo-oligo-saccharides, hydrolysed crustaceans (source of glucosamine), borage oil, green tea and grape extracts (source of polyphenols), marigold extract (source of lutein), hydrolysed cartilage (source of chondroitin). Nutritional additives: Vitamin A: 29300 IU, Vitamin D3: 800 IU, E1 (Iron): 51 mg, E2 (Iodine): 5.1 mg, E4 (Copper): 10 mg, E5 (Manganese): 67 mg, E6 (Zinc): 200 mg, E8 (Selenium): 0.11 mg - Preservatives - Antioxidants. Protein: 27% - Fat content: 17% - Crude ash: 5.7% - Crude fibres: 2.7% - EPA/DHA: 4 g/kg. *L.I.P. : protein selected for its very high assimilation. Below are some recent questions we've received regarding Royal Canin Size Health Nutrition Maxi Ageing 8+ Dog Food, including answers from our team. You can soak this kibble before feeding it if you want to, but you do not have to do this. It is up to you. I believe that this is what is meant by rehydratable kibble. If your GSD is losing weight and eating her pooh then I suggest she is taken to a vet. She could easily for example have a pancreatic problem which would need specific treatment, not just a change in diet. This food should be good for her, but I think she might need something else as well.